If you want to learn to capture an audience, listen to those who do it for a living: The actors’ techniques shared in “The Pin Drop Principle” are sure to get you the reaction you want. Effective communication never consists of words alone. There must be a purpose behind those words that calls an audience to action. The result of this action is, ideally, identical to what we call a communicator’s objective. Simply put, your objective is the goal or purpose you hope to achieve with your audience as a result of the delivery of your message. A computer sales rep wants to sell a computer, a teacher wants the students to learn their state capitals, and a safety manager wants the workers to avoid injury. Before delivering any message, you need to understand what you want at the end of your communication. What is your super-objective? Is it buy-in from the other party, or commitment for more funding, or additional personnel? Is it a signature on a contract or the adoption of a new policy? Whatever the goal is for your communication, you need to clearly understand it for yourself. Otherwise you risk being like a marathoner who runs and runs but has no idea where the finish line is. Write it down, using concrete language. If you have more than one objective, express each clearly and concretely. Once you know your objective you have half of what you need to communicate effectively. The other half is the communicator’s secret weapon and most invaluable tool–intention. Often when we develop a message, we focus primarily on the words and content we are delivering. We usually also have an objective in mind, of course, even if we have not defined it carefully and precisely. What we often fail to ask ourselves is why that overall message should be important to our audience. Why should they care? What would make them care? We neglect to pair intention with objective. This very common mistake is usually fatal to effective communication. Understanding the importance of intention and deploying it effectively is the cornerstone of brilliant acting, often separating a memorable performance from a forgettable one. For your communication to have impact, you first must decide how you want your audience to act upon your message (your objective); then you need to pinpoint an intention to deliver that message in order to best achieve that action. Finally, you must activate what are known as your intention cues–the vocal and physical manifestations of your intention–to ensure the words and delivery match up and the message achieves the desired result with your audience. Everything you do with your voice and body must support your intention. When all of your vocal and physical cues are in sync with your chosen intention, this is called congruence. When you offer mixed signals, or there is a disconnect between what you are saying and how you are saying it, your audience can become confused or distracted. This is called incongruence and it is the enemy of effective communication. For instance, if a doctor’s intention is to convince a patient to eat a healthier diet, his intention cues would have to reflect that. Depending on the patient, cues might include a serious facial expression, direct eye contact, and a warm but serious tone of voice. Other signals such as rushed speech, flickering eye contact, or attention to the file or the clock rather than the patient can convey a lack of seriousness or concern and lead the patient to tune out the message. Once you understand your objective and intention, you can become aware of how your intention cues get your audience to react the way you want. By shouting, you will get a room of children to be quiet; by waving your arms wildly you will get the attention of the lifeguard; by smiling at your coworkers you will let them know you are happy to see them. Just as an actor might identify various intentions throughout a scene, someone presenting in a corporate environment will most likely move through different intentions over the course of a speech or presentation. We call these primary and secondary intentions. The primary intention will be your main intention and the one that connects most directly to your super-objective, while secondary intentions are no less important but shift according to the smaller objectives you move through in the course of the presentation. You might think of the primary intention and the super-objective in terms of strategy, while your secondary intentions and objectives are tactics in support of that strategy. As a speaker moves from one intention to the next, noticeable changes should take place in eye contact, facial expressions, vocal aspects, and body language to help signify and communicate that change to the audience. Each of these transitions from one intention to the next must be clear. For example, the intention at the opening of your presentation might be to welcome your audience, but could shift to reassure as you begin presenting industry trends, and then to excite as you unveil the new product you will be launching. Actors call these transitions that move you from moment to moment beats. Every communication you deliver will include various intentions and objectives. Understanding what you want and how you are going to get it is important whether the communication is in a formal business setting or happens more informally over drinks with friends. If the message you are delivering is in the form of a speech or presentation, you may take advantage of the format (which is prepared in advance to the point of written notes or talking points, an outline, or a full manuscript) to practice breaking your message down into beats. Actors do this when they mark up their scripts, physically marking or coding each section by intention and objective. Once your objective and intention are engaged, these two elements will often do your communication work for you. If you can generate a genuine feeling or emotion inside, it will be reflected in what others see and hear. But this cannot happen without your choosing and activating a specific intention and objective. To impact or influence your audience you must have clarity and purpose in your message, and this can only happen through identifying an objective for your communication and then activating the specific intention (or intentions) that will move you toward it and result in your audience reacting the way you want them to react. 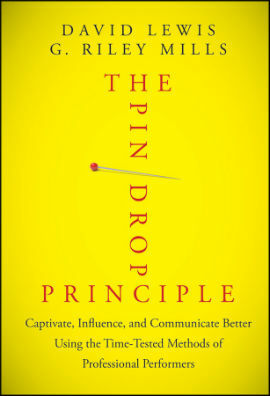 Reprinted by permission the publisher, John Wiley & Sons, Inc., from The Pin Drop Principle by David Lewis and G. Riley Mills; Copyright (c) 2012 by David Lewis and G. Riley Mills.